We designed our Foundation Plan to be the core group of products you will need to get your health back. The plan includes 5 exceptional supplements: Foundation Formula, Herbal Biotic, Binder Blend, Adaptogen Immune, and Bio-Assist. This is a perfect group of products for you to start feeling better and return healthy. First, our Foundation Formula has been designed as the key building block for this program. It is our cornerstone product, effective on its own, but works optimally by tying together the other 4 Foundation Plan supplements. 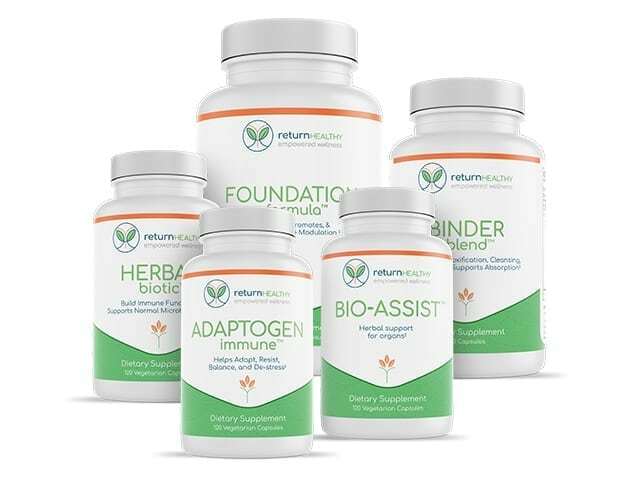 This supplement contains a combination of herbs and plant extracts, like resveratrol from Japanese Knotweed, that work as antioxidants, adaptogens, and detoxification support. We’ve also included our Bio-Assist to support and protect your organs while optimizing their function. Chronic Illnesses like Lyme Disease are hard on your system and we want to help you protect your organs so you can fight the illness and get back to life. 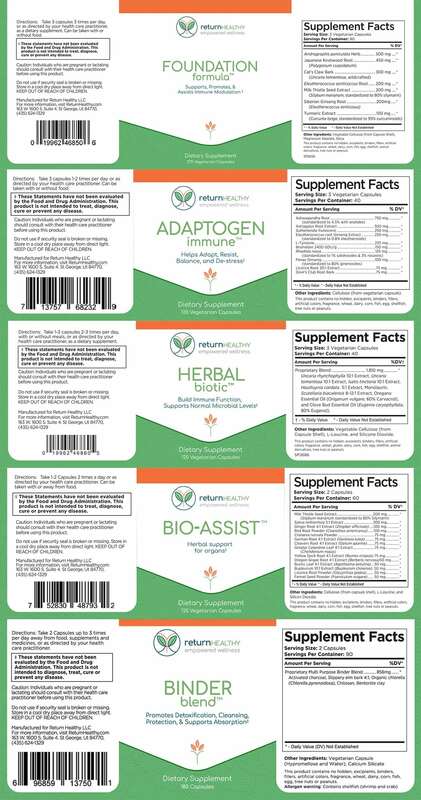 Our Herbal Biotic supports normal microbial levels through the use of concentrated herbal extracts. When microbes are lower, it has a greater effect on your overall health. We’ve included herbs that help support your immune system while also supporting the body’s response to die off reactions. 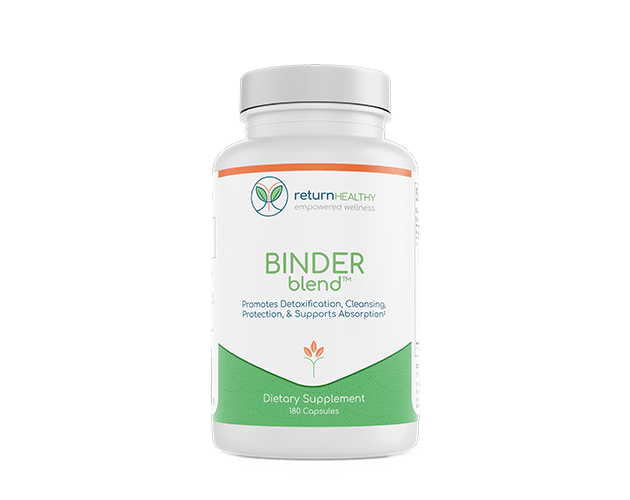 Using Binder Blend is a great way to enhance your body’s detoxification. It uses a combination of activated charcoal, chlorella, and bentonite clay to catch and trap immune irritating toxins so they can be moved through and out of the digestive tract with the help of slippery elm bark. Helping your body remove toxins will greatly support the healing process. Adaptogen Immune uses a combination of herbs and medicinal plants to help your body build resistance to stress while also bringing your body closer to a balanced state called homeostasis. Foundation Formula: Andrographis paniculata Herb 500 mg, Japanese Knotweed Root (Polygonum cuspidatum) 450 mg, Cat’s Claw Bark (Uncaria tomentosa, wildcrafted) 300 mg, Eleutherococcus senticoccus Root 200 mg, Milk Thistle Seed Extract (Silybum marianum, standardized to 80% silymarin) 200 mg, Turmeric Extract (Curcuma longa, standardized to 95% curcuminoids) 100 mg.
Bio-Assist: Milk Thistle Seed Extract (Silybum marianum standardized to 80% Silymarin) 200 mg, Salvia miltiorrhiza 5:1 Extract 200 mg, Ginger Root 4:1 Extract (Zingiber officinale) 100 mg, Red Root Powder (Ceanothus americanus) 100 mg, Crataeva nurvala Powder 75 mg, Gentian Root 4:1 Extract (Gentiana lutea) 75 mg, Cleavers Root 4:1 Extract (Galium aparine) 75 mg, Greater Celandine Leaf 4:1 Extract Chelidonium majus) 75 mg, Yellow Dock Root 4:1 Extract (Rumex crispus) 75 mg, Oregon Grape Root 4:1 Extract (Berberis nervosa) 50 mg, Buchu Leaf 4:1 Extract (Agathosma betulina) 50 mg, Bupleurum 10:1 Extract (Bupleurum chinense) 50 mg, Licorice Root Powder (Glycyrrhiza glabra) 50 mg.
Binder Blend: Charcoal, activated 240 mg, Chlorella, Organic (Chlorella pyrenoidosa) 240 mg, Bentonite Clay 25 mg, Slippery Elm Bark (Ulmus rubra) 240 mg, Chitosan 110mg, Calcium Silicate 5mg. Adaptogen Immune: Ashwagandha Root (standardized to 4.5% with anolides) 750 mg, Astragalus Root Extract 300 mg, Sutherlandia frutescens 250 mg, Eleutherococcus root Ginseng Extract (standardized to 0.8% eleutheroside) 250 mg, L-Tyrosine 225 mg, Bromelain 2400 GDU/g 150 mg, Rhodiola rosea (standardized to 1% salidrosides & 3% rosavins) 125 mg, Panax Ginseng (standardized to 80% ginenosides) 100 mg, Licorice Root 20:1 Extract 75 mg, Devil’s Club Root Bark 75 mg.